John Junior Lomas, age 95, of Mt. 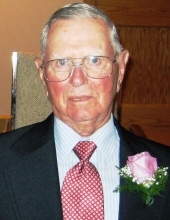 Vernon, Missouri, passed away at 9:15 p.m. on Monday, November 12, 2018, at the Lacoba Nursing Home in Monett, Missouri. He was born April 30, 1923, in Walnut Grove, Missouri, the son of John and Lillian (Box) Lomas. John was a 1942 graduate of Marion C. Early High School in Morrisville, Missouri and was a United States Army veteran serving during World War II. He retired as the warehouse manager after 30 years of employment with the Ozark Electric Cooperative. He was a member of the Ozark Prairie Presbyterian Church, where he served as a deacon, elder and the clerk of the session. On May 23, 1948, he married Helen Irene Orr, in Springfield, Missouri. She preceded him in death on May 17, 2018. John is survived by his daughter, Anita Hansen of Norman, Oklahoma; two sons, Lyle Lomas and his wife, Connie, of Dennis, Kansas and Leland Lomas and his wife, Renee, of Hilmar, California; one sister, Velma Harrell of Anaheim, California; eight grandchildren; six great-grandchildren and several nieces and nephews. His parents, John and Lillian, wife, Helen, brother, Leon Lomas and his sister, Anna Pearl Fender, preceded him in death. A visitation will be held from 1:00-2:00 p.m. on Monday, November 19, 2018, at the Ozark Prairie Presbyterian Church with a funeral service to follow at 2:00 p.m. Burial will follow at the Ozark Prairie Cemetery. Funeral arrangements are under the direction of the Fossett-Mosher Funeral Home in Mt. Vernon. Memorial donations may be made payable to the Ozark Prairie Cemetery Association or the Salvation Army, in care of the funeral home. Online condolences may be shared at this website. To plant a tree in memory of John Junior Lomas, please visit our Tribute Store. Ozark Prairie Cemetery, Mt. Vernon, MO. "Email Address" would like to share the life celebration of John Junior Lomas. Click on the "link" to go to share a favorite memory or leave a condolence message for the family.